Register for Ali's Rae of Hope 5k today! Come join us for Ali's Rae of Hope foundations first ever 5k on May 18th, 2019! Runners will have the opportunity to dress up as their favorite fairy tale character, the best costume will win a prize! All proceeds will provide financial assistance to those families whose child is currently in treatment for a pediatric brain tumor or brain cancer. Ali is the oldest daughter to Station Camp Baseball Coach Shane Tipton, Jack Anderson Elementary School Nurse Ashley Tipton, and sister to Bison Volleyball Player Kendall Tipton. Ali was diagnosed with a grade 1 Ganglioglioma on January 19, 2012. This tumor, although not graded as cancerous, was on her brain stem, which controls every major body function. She had surgery to remove the tumor a week and a half later. Due to the tumor’s vital location, only half of it was able to be removed during a 9 hour surgical procedure. Ali then began daily radiation therapy for 6 weeks and then embark upon a year long round of chemotherapy. Over the next 4 years, Ali would endure 3 separate year long rounds of chemotherapy, 3 port surgeries, a gall bladder surgery mixed in with instances slight tumor growth and tumor stability. In April 2016, during a 6 month post-chemo MRI appointment, we thought we were finally over the hump until the oncologist told us that two new tumors had appeared on her cerebellum and one on her spine. It was discovered that Ali was BRAPH positive meaning that the likelihood that her tumor would mutate into something else later on. Well that time was now and after a removal of one of the surface tumors on her cerebellum, Ali was diagnosed with Glioblastoma, a grade 4 brain cancer. This is the same cancer Senator John McCain recently passed away from and preceded in death by Massachusetts Senator Ted Kennedy, also from Glioblastoma. Life expectancy for Glioblastoma is 12-15 months. Ali passed away on June 22, 2016 while we were on vacation in Panama City Beach Florida. She just wanted to be a normal teenager like everybody else. 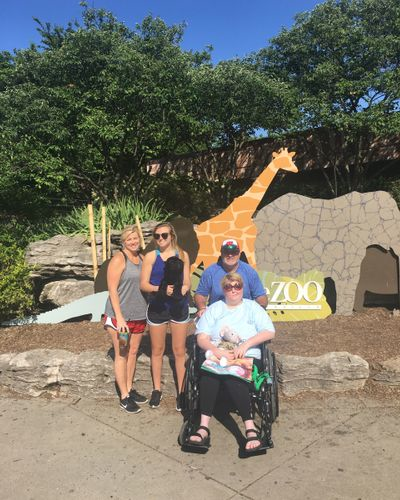 She didn’t want to be singled out for having a brain tumor, but to live life, enjoying each and every day, making memories instead of fretting over the hand she had been dealt. Ali is our hero. In her honor and memory, we have established the Ali’s Rae of Hope Foundation. Our foundation provides financial assistance to families with a child receiving treatment for a brain tumor or brain cancer. This in hopes of relieving the financial burden if only for a second while allowing them to make memories each and every day.